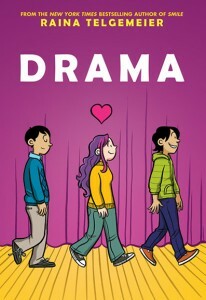 In 2014, Raina Telgemeier’s Drama made the American Library Association’s top 10 list of frequently challenged books due to a ban at Chapel Hill Elementary School in Mount Pleasant, Texas. The specific reason for the ban has not been publicly confirmed, but we can hazard a guess based on a small but vocal minority of online reader reviews objecting to the inclusion of two gay characters, one of whom shares a chaste on-stage kiss with another boy. In hopes of preventing any further bans of Drama, we’ve put together these resources for librarians and educators who may need to justify and defend the inclusion of the book in library and classroom collections. Callie loves theater, and while she would totally try out for her middle school’s production of “Moon over Mississippi,” she’s a terrible singer. Instead she’s the set designer for the stage crew, and this year she’s determined to create a set worthy of Broadway on a middle-school budget. But how can she, when she doesn’t know much about carpentry, ticket sales are down, and the crew members are having trouble working together? Not to mention the onstage and offstage drama that occurs once the actors are chosen, and when two cute brothers enter the picture, things get even crazier! Callie loves the theater, even if she can’t sing well enough to perform in her beloved musicals. But when drama and romance — both onstage and off — cause problems, Callie finds that set design may be the easiest part of putting on a play. Telgemeier is prodigiously talented at telling cheerful stories with realistic portrayals of middle-school characters. Callie is likable, hardworking, and enthusiastic, but she is as confused about relationships and love as any young teen, and she flits from crush to crush in a believable fashion. Nonactors will love having a spotlight shine on the backstage action, but even those who shun the stage will identify with this roller-coaster ride through young teen emotions. In addressing issues such as homosexuality, Drama is more teen-oriented than Telgemeier’s elementary-school-friendly Smile (2010). Her deceptively simple art may seem cartoonish, but it is grounded in a firm sense of style and washed in warm colors to give the story an open, welcoming feel. In this realistic and sympathetic story, feelings and thoughts leap off the page, revealing Telgemeier’s keen eye for young teen life. Like Telgemeier’s previous graphic novel, Smile (a 2010 Boston Globe-Horn Book Honor Book), this new one will appeal to a wide range of readers. Seventh-grader Callie Marin loves musical theater, and though she isn’t much of a singer (which she good-naturedly proves to all in a hilarious scene), she expresses and fulfills her passion by working as a set designer for the school drama club. Her second year on stage crew turns out to be fraught with drama, on and off the set. Not only is the musical a love story, but in real life Callie has a crush on eighth-grader Greg, whose younger brother (and fellow stage-crew member) has a secret crush on Callie. Greg, however, is dating Bonnie, who dumps him for her costar in the play, West, who eventually dumps her for the boy whom Callie has just begun to like. The Greg asks Callie out. Phew! But Telgemeier handles it all with aplomb and, despite the romantic drama, nothing happens beyond a few innocent kisses. She gets her middle-school characters just right — from kids who, like Justin, are gay and know it (“Gay? You can say it! I don’t mind”) to those who, like Callie, wouldn’t recognize a gay guy if he clasped his hands and squee-ed over musical auditions, as Justin does when they first meet. As in Smile, Telgemeier’s graphic artist skills make this novel a pleasure to read and re-read; of special note is her thoughtful use of the page turn — for surprise, for a pause, for emotional effect. From award winner Telgemeier (Smile, 2010), a pitch-perfect graphic novel portrayal of a middle school musical, adroitly capturing the drama both on and offstage. Seventh-grader Callie Marin is over-the-moon to be on stage crew again this year for Eucalyptus Middle School’s production of Moon over Mississippi. Callie’s just getting over popular baseball jock and eighth-grader Greg, who crushed her when he left Callie to return to his girlfriend, Bonnie, the stuck-up star of the play. Callie’s healing heart is quickly captured by Justin and Jesse Mendocino, the two very cute twins who are working on the play with her. Equally determined to make the best sets possible with a shoestring budget and to get one of the Mendocino boys to notice her, the immensely likable Callie will find this to be an extremely drama-filled experience indeed. The palpably engaging and whip-smart characterization ensures that the charisma and camaraderie run high among those working on the production. When Greg snubs Callie in the halls and misses her reference to Guys and Dolls, one of her friends assuredly tells her, “Don’t worry, Cal. We’re the cool kids….He’s the dork.” With the clear, stylish art, the strongly appealing characters and just the right pinch of drama, this book will undoubtedly make readers stand up and cheer. Seventh-grader Callie has been in love with the stage ever since she saw Les Miz when she was younger. Since her singing skills leave much to be desired, she’s forged a place for herself at the drama club as the set decorator. While her love for the stage is clear, which boy she loves is a different matter. Is it Greg, the handsome eighth-grade jock who trifled with her while on a break from his diva girlfriend, Bonnie? Or Justin, the cute boy who is playing the comic relief in the middle school production of Moon over Mississippi? — who happens to be gay. Or what about his twin brother, Jesse, who isn’t gay and is helping Callie with set decorating? The author follows up her award-winning graphic novel Smile with another dead-on look at the confusing world of middle school, sweetly capturing all the drama swirling around the school production: from jealousies and misunderstandings to the last-minute surprise stage substitution that may not make a star, but helps settle who likes who. Telgemeier’s manga-infused art has some moments of heartache, but the generally cheerful and affirming story should be eagerly devoured by her many fans. Ages 10-14. If you read reviews on Raina Telgemeier’s previous graphic novel, Smile, you’ll see words like “charming” and “sweet.” Her second attempt at capturing the middle school years is no less successful, and Telgemeier sticks with what she’s good at, capturing the middle school years. Let me tell you, Telgemeier hits the drama and to-do of those tumultuous years right on the head of the nail. Callie fell in love with the theater when her mother took her to a production of Les Miserables. But she quickly learned that she didn’t have what it takes to be onstage, so instead Callie is more than content with being part of the crew backstage. When her middle school puts on a musical, Callie is thrilled to be in charge of set design, but the drama on stage quickly spills offstage. There are twin brothers, boys who like Callie, and boys Callie likes. There’s best-friend drama, and of course, putting on a full-scale musical production (even in middle school) is full of commotion. The middle school I work in has put on a number of musicals, and Telgemeier really captures the frenetic pace of putting on a production. (In reality, at this age, teachers are a bit more involved in the process, but I chalked that up to poetic license.) There’s excitement and passion. The kids feel great about everything that they accomplished. There are friends’ politics. Reading Drama, I felt like I was standing in the corridors of my own school. And today’s issues aren’t ignored, though they’re not actually issues in the book, such as characters coming to terms with their sexual identity. The comic only strengthens when you consider the artwork. Telgemeier already has a signature style, a look that marks the artwork as her own, but there were a couple of scenes that truly shine. When Callie shows Jesse her favorite theater books, the scenes are full of passion as Callie is drawn into a giant book, showing Jesse why the books are so magnificent. It moves the artwork from a level of cute and sweet to truly outstanding. This is going to be on every upper elementary school, middle school, and even high school shelf. Readers, especially young female ones, will eat up the title. Using Graphic Novels in Education is an ongoing feature from CBLDF that is designed to allay confusion around the content of graphic novels and to help parents and educators raise readers. In this column, we examine graphic novels, including those that have been targeted by censors, and provide teaching and discussion suggestions for the use of such books in classrooms. You can view the column for Drama here. What should I do if Drama is challenged? Most challenges to comics in libraries come from well-meaning individuals, frequently parents, who find something they believe is objectionable in their local public or school library. These challenges are often difficult and stressful for the library staff who must manage them, but there are resources to help them in the process. Below we’ve identified a number of tips and links to assist libraries to increase the likelihood of keeping challenged comics on the shelves. Strong selection and challenge review policies are key for protecting access to library materials, including comics. The American Library Association has developed a number of excellent tools to assist school and public libraries in the essential preparation to perform before books are challenged here. CBLDF can also help by providing assistance with locating review resources, writing letters of support, and facilitating access to experts and resources. Call 800-99-CBLDF or email info@cbldf.org at the first sign of a First Amendment emergency! Another essential step in protecting access to comics is to report challenges when they occur. By reporting challenges, you help the free expression community gather necessary information about what materials are at risk so better tools can be created to assist. To report a challenge to the Comic Book Legal Defense Fund, call us at 800-99-CBLDF or email info@cbldf.org. You can also report the challenge to the Kids’ Right to Read Project, a CBLDF-sponsored program from the National Coalition Against Censorship and one of our frequent partners in the fight against censorship. Finally, you can report the challenge to ALA here.